Winner of a DLG Silver Medal at Agritechnica 2011, John Deere’s Machine Sync machine to machine communication system has been in operation during the 2017 cereal harvest with several UK customers. Designed for use with combines and tractors, Machine Sync enables machines to exchange data on the move to improve the efficiency of the harvesting and unloading operation, and allows the combine operator to ‘guide’ a tractor and trailer alongside the harvester. During operation, the tractor driver can view a map that displays the position of the harvesters and other tractor/trailer units in the field. Depending on the level of grain in the combine’s tank, Machine Sync sets priorities for the unloading process and indicates which harvester needs to be unloaded next, when there is more than one in the field. In turn, the combine operator can actively call a tractor and trailer to begin their approach for unloading. An additional feature enables the tractor operator to accept the unloading request, which will automatically exclude other tractor/trailer units from approaching the same combine. Machine Sync can then allow the combine operator to take command of the tractor and grain trailer, once a predetermined distance from the combine is reached. 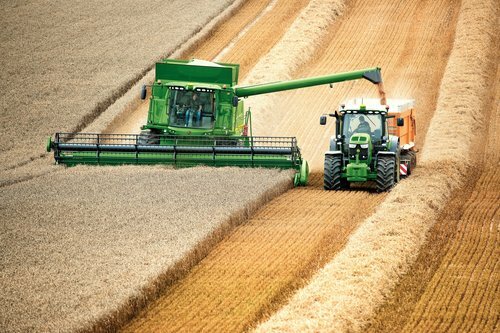 When Machine Sync is activated, the combine operator begins to steer the tractor and trailer relative to the combine’s speed and travel direction. Machine Sync Automation uses Machine Communication Radio (MCR), a robust wireless router that allows up to 10 machines in a single network to communicate and share information with one another, within a one mile radius. Both the combine and tractor require a StarFire satellite receiver, Machine Sync activation and a GreenStar 3 2630 display for the system to work. In addition, coverage maps and guidance lines can be shared between machines using the Machine Sync Shared Data option, which can be achieved using MCR or John Deere’s JDLink modular telematics gateway (MTG) controller. As well as providing more accurate harvesting data, this system would be suitable for drilling, spraying and fertiliser spreading, to allow any John Deere Section Control enabled machine to activate on/off controls based on another machine’s coverage.